Our manufacturer has been making quality products since 1972. Our baptisteries are durable and easy to maintain. With our numerous designs, chances are we have just the baptistery you are looking for. With a long history of integrity and a 10-year warranty on materials and workmanship, you can also be assured that your investment is the right one. Do you need Aqua Seal? The optional Aqua Seal process is available on all baptistery models. This feature allows for water to be left in the baptistery for extended periods of time. Without Aqua Seal, water must be drained after each use. All Baptisteries are available in your choice of the following colors: Blue, White, Aqua, and Tan. On single entrance baptisteries, the left or right entry is determined from the congregation's point of view. All Baptisteries are manufactured with high quality gel-coat and layers of polyester resin and fiberglass. Structural supports consist of tubular bracing and structural timber molded into the baptistery. Window models feature 1/2" acrylic windows. 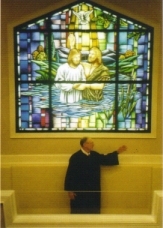 Windows are to be installed by the customer after the baptistery is installed. 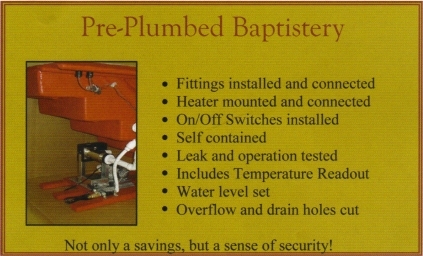 All Baptisteries are shipped with easy to follow installation directions. To allow for the best possible fit, we recommend not framing the baptistery until the unit arrives. We do not recommend leaving water in the baptistery for an extended length of time. The optional Aqua Seal process is available on all baptistery models. This feature allows for water to be left in the baptistery for extended periods of time. All Baptisteries are guaranteed for 10 years against structural failure. To order Catalogs of anything you need, or for product and delivery information, please click here.